Merciless, black-armoured enforcers, Hellknights care nothing for good or evil, only their absolute, unflinching vision of law. In Pathfinder Campaign Setting: Path of the Hellknight, you'll join the ranks of Golarion's harshest champions of order—knights with ironclad discipline forged in the flames of Hell. Learn the ways of all the Hellknight orders, their true relationship with the legions of Hell, and how to tie your characters to one of Pathfinder's most fearsome organizations. Players and Game Masters can also lay claim to the complete Hellknight arsenal, from terrifying battle arts and grim equipment to the secrets of masked signifers' frontline magic. The Hellknights' unstoppable might is yours to command as you impose unshakable order—whatever the cost. Details about joining a Hellknight order, as well as a timeline of the orders' histories and a comprehensive look at the Measure and the Chain, the philosophies that guide these knights. In-depth descriptions of the seven major Hellknight orders, including the brutal physical reckonings from which they draw great power. An arsenal of feats, spells, and equipment these lawful crusaders typically use, plus class options such as the order of the Ennead Star cavalier order and new disciplines for the Hellknight prestige class. 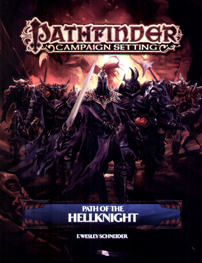 Pathfinder Campaign Setting: Path of the Hellknight is intended for use with the Pathfinder Roleplaying Game and the Pathfinder campaign setting, but can easily be used in any fantasy game.